Bio: Came from England (rain) to the Willamette Valley, OR (rain plus) in 1977. Met Diane rock climbing in the desert. Together, we adventured to high mountains, steep crags, arid landscapes always east or south of where we lived; even marrying at Burning Man. In January 2012, our dog refused to walk out in the drizzle and posed the question: why don't we find a place as close to Red Rocks as we can afford? Our longterm friends ("it's beautiful when the rain stops") concluded we'd gone to the darkside. ("Did YOU know they gambled?"). 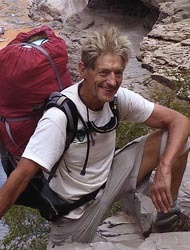 Why did you join the 52 Peak Club: Drawn to Branch's book because it described off trail routes. Intrigued that a group was exploring those routes. First hike: Mescalito. Eric was encouraging, the scrambling athletes were welcoming and the mountain was stunning. 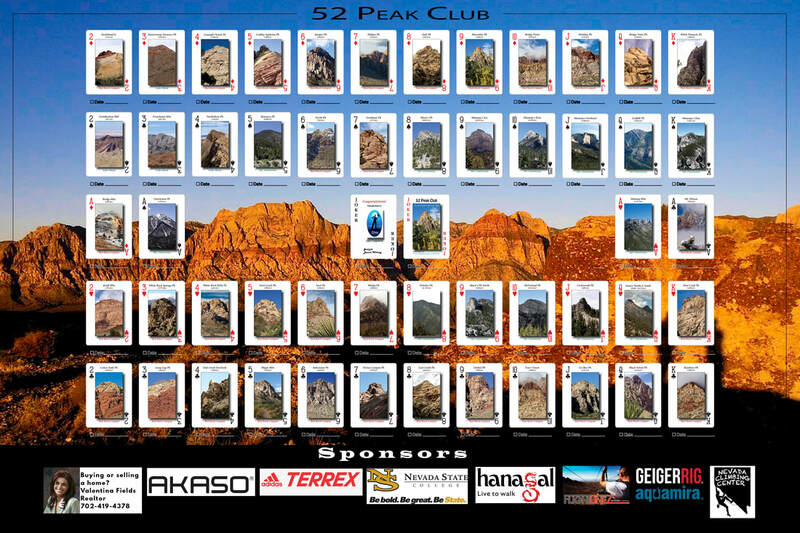 Signed up for the 52 Peak Club April 22nd 2012. Toughest Peak: All peaks deserve respect and full concentration. On some days you might be less prepared than you should be. 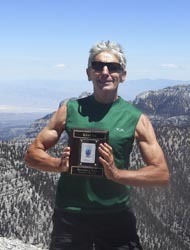 After returning from six weeks at sea level, I joined a fas hike to Pine Creek Peak. I was inadequately prepared for altitude and hydration. That was the toughest. But when I do it again I expect it to be fun. Favorite Hike: Favorite hikes were the 51st and 52nd. Macks North Traverse with Kevin and Mel's Mt Charleston hike. How did you feel once you became a 53er: Incredulous that I'd done it. Grateful to all the leaders who've shown the way. Happy to have been with such positive hiker athletes. Sad that Diane couldn't be there. Advice for new hikers: Keep fit. Train. Stay hydrated. Concentrate on secure feet and hands. Respect the rocks. Observe the wildlife and flora. Enjoy your fellow hikers. Thank your leader/organizers.